Trick horse clinics can be done in half day, one or two day formats. We start our clinics with a 45min sit down session to talk about how horses learn, horse personalities and what will influence the learning of your horse. We play a couple of games to help participants start thinking about positive reinforcement and engaging their horses' mind and then we also cover a few safety points. After that we head to the arena and cover a number of trick including the smile, hug, wave, one knee bow, two leg bow, targeting, say no, basic liberty work, pedestal work and more as we have time. Students will learn how to teach their horses: Hug, smile, pedestal, say yes, play with toys, target, ground control, bow, wave and more! Our clinics are 100% force-free methods. You'll find no short cuts, gimmicks or tools - just hard work, a positive attitude and plenty of laughs. Clinics start at just $600 for a group of 6 making them very affordable for anyone wanting to get involved. We are able to host clinics either at our outdoor arena at the farm or at a host location, whichever is easiest for you. 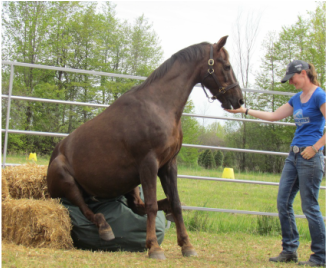 All clinics can include a demonstration with one of our trick horses to help students understand each trick they are trying to teach. ​Don't have a horse? 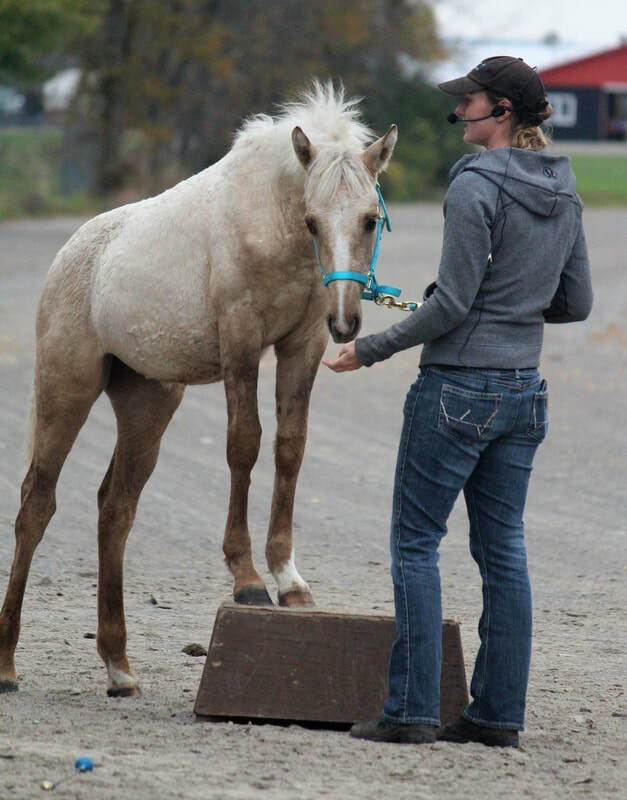 You are welcome to learn trick horse training with one of the amazing Morgans at our farm! ​You are welcome to use one of our horses or bring your own! No previous experience is necessary to start taking the lessons. Private trick training lessons start at $40 for a 30 min session. We also will travel to sites for lessons however there must be approval by the barn manager and a mileage charge will be added to the cost of the lesson. Contact us for details! We also will travel to sites for lessons however there must be approval by the barn manager and a mileage charge will be added to the cost of the lesson at a rate of $0.60/km which can be split amongst participants. Of course trick horse training can be taught to all ages of horses with any level of training. 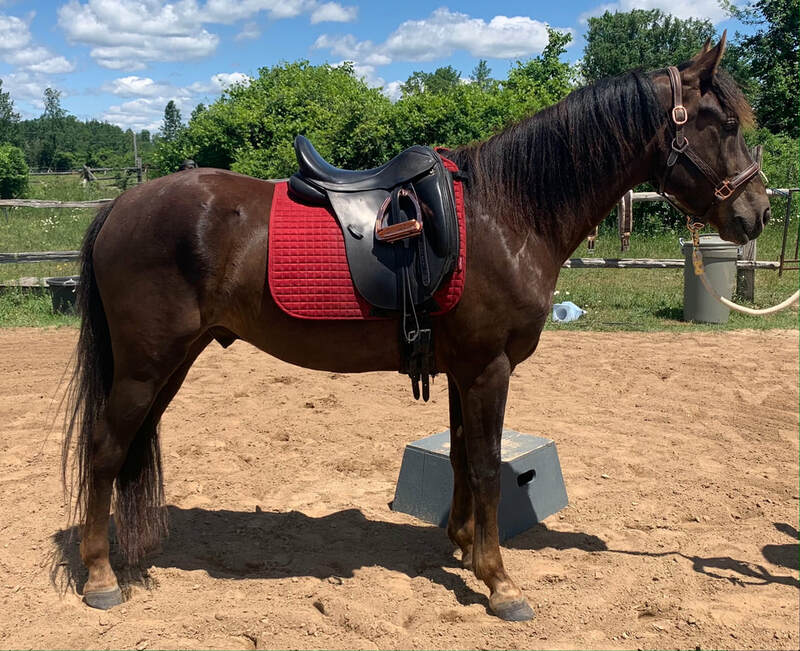 From halter broke yearlings all the way up to 30 year old retired riding horses, any horse can benefit from this type of training A horse does not need to be broke to ride and does not have to be athletically fit to be taught tricks. Trick training will help your horse become more flexible and balanced while developing trust and confidence in your as a handler. Is Trick Training for Me? I have taught many clinics with a wide arrangement of horses and participants. Most people come to the clinics with a great attitude and an open mind. They are willing to learn, work hard and have a ton of laughs. If you are one of those people, I am sure you will fall in love with trick training just as I have. ​Don't have a horse? 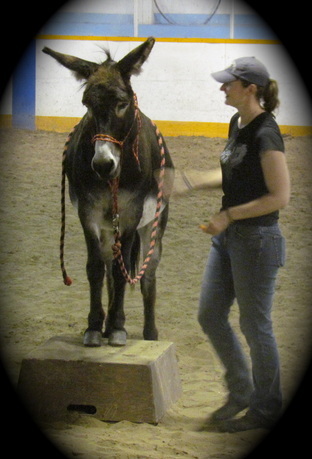 Caylyn loves a challange she has trick trained donkeys, goats, mules and even a Zebu cow! 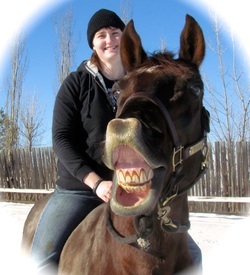 Caylyn has performed Trick Horse Clinics and demonstrations all over Alberta for everyone from 4H groups, horse owners, Canada Day events and even the Northlands Farm and Ranch show! 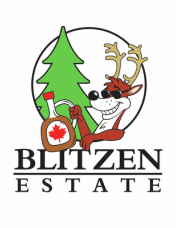 Since our move, we are now offering services in the Eastern Ontario region. Clinics and lessons can be done on or off site and can include demonstrations with one of our trick horses. Riley and Caylyn have been together for 16 years and like a true morgan, Riley is extremely versatile. He has competed in shows all over Alberta in numerous disciplines, but most impressively in 2012 he and Caylyn also won two World Championship titles in Dressage while in Oklahoma at the Morgan World Show. Aside from actively competing, Riley was also our star for the trick horse clinics and demonstrations. He has a very engaging personality and loves to show off. He performs numerous tricks including: smile (his favourite), hugs, wave, high step walk, pedestal, pick up an object, play ball, say yes, say no, curtsy and most recently the rear. Riley's age is starting to catch up with him so he is no longer available for demonstrations or clinics offsite, but he does occasionally make an appearance for our onsite clinics. Raine is slowly learning the ropes and will hopefully some day fill Riley's big shoes! In the meantime Smoke travels to most of the clinics. Learn more about our trick horses under Meet Our Trick Horses. We would love to host a clinic at your location, contact us for more details! !